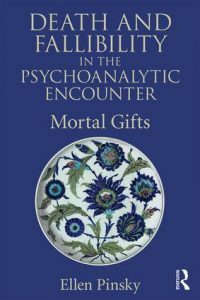 Death and Fallibility in the Psychoanalytic Encounter: Mortal Gifts (Routledge, 2017) recently published by BPSI’s faculty member Ellen Pinsky, PsyD, considers psychoanalysis from a fresh perspective: the therapist’s mortality―in at least two senses of the word. That the therapist can die, and is also fallible, can be seen as necessary or even defining components of the therapeutic process. At every moment, the analyst’s vulnerability and human limitations underlie the work, something rarely openly acknowledged. Check out a recent review of this book by Sharone Bergner, PhD, published in the International Journal of Psychoanalysis, 99: 1509-1513, Aug 2018. Freud’s central insights continue to guide the range of all talking therapies, but they do so somewhat in the manner of a smudged ancestral map. That blur, or degree of confusion, invites new ways of reading. Ellen Pinsky reexamines fundamental principles underlying by-now-dusty terms such as “neutrality,” “abstinence,” “working through,” and the peculiar expression “termination.” Pinsky reconsiders―in some measure, hopes to restore―the most essential, humane, and useful components of the original psychoanalytic perspective, guided by the most productive threads in the discipline’s still-evolving theory. Freud’s most important contribution was arguably to discover (or invent) the psychoanalytic situation itself. This book reflects on central questions pertaining to that extraordinary discovery: What is the psychoanalytic situation? How does it work (and fail to work)? Why does it work? This book aims to articulate what is fundamental and what we can’t do without―the psychoanalytic essence―while neither idealizing Freud nor devaluing his achievement. Historically, Freud has been misread, distorted, maligned or, at times, even dismissed. Pinsky reappraises his significance with respect to psychoanalytic writers who have extended, and amended, his thinking. Of particular interest are those psychoanalytic thinkers who, like Freud, are not only original thinkers but also great writers―including D. W. Winnicott and Hans Loewald. Covering a broad range of psychoanalytic paradigms, Death and Fallibility in the Psychoanalytic Encounter will bring a fresh understanding of the nature, benefits and pitfalls of psychoanalysis. It will appeal to psychoanalysts and psychoanalytic psychotherapists and provide superb background and inspiration for anyone working across the entire range of talking therapies. Ellen Pinsky, PsyD, is a winner of the Deutsch Prize for writing. Her articles and reviews have appeared in The Psychoanalytic Quarterly, Journal of the American Psychoanalytic Association, American Imago, Salmagundi, and The Threepenny Review. Pinsky’s recent paper Mortality, Integrity, and Psychoanalysis (Who Are You to Me? Who Am I to You?) appeared in Flirting with Death: Psychoanalysts Consider Mortality, edited by Corinne Masur. London and New York: Routledge, 2018. The audio recording of Ellen Pinsky’s Meet the Author event on October 17, 2017 is available from library@bpsi.org upon request.